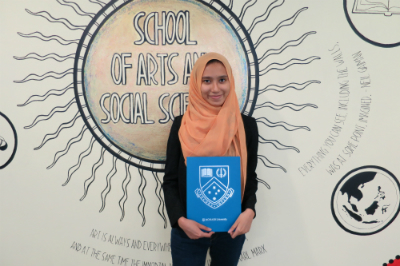 "I’m grateful for the variety of experiences I’ve had at Monash, from being able to study a plethora of subjects to meeting great people like my lecturers and friends." I work as a freelance writer and researcher. Currently, my projects include writing for Banking Insight, a publication by the Asian Institute of Chartered Bankers, and Accountants Today, a publication by the Malaysian Institute of Accountants. I am also an Assistant Coach at Awake Minds, an affordable education program where I teach English. In the age of digitisation and increasing automation, many jobs are at risk of obsolescence. My time at Monash Malaysia prepared me for the working world by equipping me with skill sets that are not only marketable and relevant, but also proprietary and irreplaceable. Here, I was able to hone technical skills like writing, as well as soft skills like creativity, critical thinking, and leadership— qualities that are non-transferable and cannot easily be replicated by machines. The opportunity I recall most distinctly would be participating in the International Conference for Undergraduate Research (ICUR), a program held by the Monash-Warwick Alliance. As someone interested in academia and completing postgraduate education, this stood out to me because it gave me a safe space to explore my interests and try my hand at putting together an independent research project on a global platform. Though I’ve always had a clear vision of what I wanted— for example, success and financial security— the plans to achieve these visions were less clear. In a sense, while I knew my destination, I was uncertain of the road I wanted to take to get there. Going into Monash, I had a few ideas on what my interests and passions were. However, I had yet to settle on which field I wanted to make my profession. I found more clarity while studying the BA Global at Monash. Rather than one moment, there were a few experiences that changed the direction of my life and reinforced this decision. Originally, for example, I wanted to study linguistics in the UK. After taking an introductory linguistics unit at Clayton campus during my semester abroad, however, I realised I didn’t want to pursue this field at all. Majoring in International Studies also showed me that I was far more captivated by subjects like International Political Economy and International Relations— which is what I’d like to pursue in the future. In my final year, I interned at Free Malaysia Today, an online news portal. The experience definitely consolidated what I learned during my undergraduate years. I wrote opinion pieces on domestic and international politics, so I could observe the patterns and lessons seen in my studies playing out in the real-life situations I analysed. To me, this was a boon because while theory is compelling, it needs to have practical application to provide full value. My time there made a difference to my life because it provided an opportunity for me to contribute to society. One comparative advantage of the social sciences, in my opinion, is that it doesn’t equip you for a job alone but seeks to prepare you as a change maker and member of society. As an opinion writer, I was able to hopefully enrich the discourse on the country’s affairs and give voice to other members of the nation. I also got a death threat for my troubles, so I suppose that was a life-changing moment too! I wanted an affordable international experience close to home at a well-ranked university known for quality research and teaching. I’m grateful for the variety of experiences I’ve had at Monash, from being able to study a plethora of subjects to meeting great people like my lecturers and friends, as well as participating in international opportunities.